Address: 3575 S. Las Vegas Blvd. Standard room amenities : Cable TV, PPV movies, coffee maker, kitchen, in-room safe, iron and ironing board, microwave, hair dryer, refrigerator, telephone with voice mail. Hotel amenities : laundry service, maid service, safety deposit boxes, VIP services, barbecue grills, tennis courts. 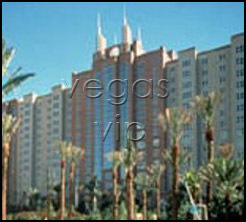 World-renowned casinos, located within walking distance from the Strip, surround the Hilton Grand Vacations Flamingo. The hotel offers many amenities including a deli, a pool and spa area, fitness room, picnic areas with barbecue grills and a guest lounge. 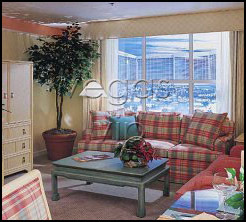 Hilton Grand Vacations Club at the Flamingo - Las Vegas is ideal for the traveler who loves being on the Strip and appreciates the ability to retreat to the quiet comfort of luxury living. Located on the grounds of the Flamingo Hotel, this property is a resort within a resort. Studios and one & two-bedroom suites afford business and leisure travelers an opportunity to relax overlooking rushing waterfalls, lush tropical gardens and a magnificent swimming complex.